Last winter someone named Kent kept telling me to go over to Missoula, Montana and look for some auto repair shop with a couple of old Packards on display in a showroom out front. Went to Missoula a month ago armed with vague directions and couldn't find it. Tried yesterday afternoon on foot....and found the shop. Struck out on the Packards, but what I found was equally interesting: a 1928 Bentley 4 1/2 Liter "Bobtail"(ex-Le Mans works car) and a '29 Duesenberg Derham Phaeton(J-270). I'm with John... We will have to forever pick on you if there are no photos. I didn't take any photos. The Duesenberg has been owned by people named Brown, Bauer and Pettit, and the Bentley was in Le Mans in 1929, if that will help. I think both cars are on the conceptcarz.com site. 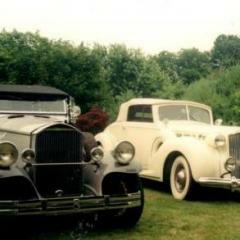 Derham only did the updates on the Duesenberg (skirts and a few other things). It's a LeBaron body. Interesting history on it. The post war "Derham cars" were NOT Derham built cars, but Derham MODIFIED cars. There is a GREAT difference. Kind of a moot point, since Duesenberg went out of business before the war.